Affiliate marketing requires an audience to present offers to. Makes sense right? You need to have people who have trust in you and/or the vendor to purchase a product presented to them. There are two major ways to reach the audience – advertising and content marketing. Paid ads work. But you need to have a budget to purchase ads and the expertise to design and execute a profitable advertising campaign. Succesful ad campaigns are not an easy thing to execute. Buying traffic also eliminates one of the big advantages of affiliate marketing – the low startup costs. With affiliate marketing, you can start with a very small budget and earn as you learn. Every skill that you acquire, keyword research, backlink outreach, content creation etc. is transferrable to any online venture. But if you have the bankroll for paid ads, have the expertise to make great funnels and landing pages — by all means go for it. It is a much faster way to get into the business. However, for most mortals grinding out a living, search and content marketing is the way to go. Search Engine Marketing (SEM) uses search engines results to create an audience for information. It is free advertising for your content. But you need to be tactical about it. You want to find a balance between the number of people searching for a term and your ability to compete for the top results. You want to establish yourself as an authority about a particular topic that is underserved. Millions of people are searching for information every minute. Google presents them with the best information for their query. Content Marketing = SEM plus all other ways of promoting your content. 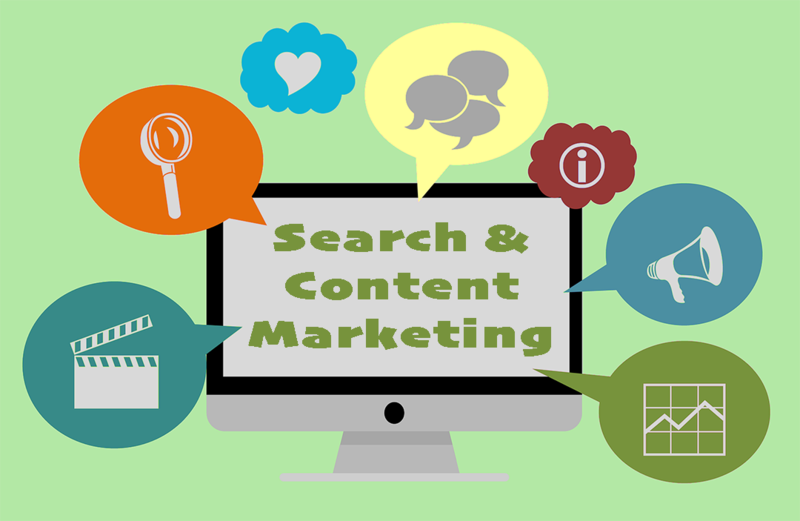 Create useful content that attracts search traffic. Develop an audience that believes and trusts you. Present affiliate products in your content that helps your audience solve a problem. Promote your content to a broad audience. When you are creating your audience with content management you are developing a longer term relationship than with paid ads. You are slowly building trust by adding value. This is a long game effort. You want to build an audience. An audience that is defined by the topics you write about. An audience that finds you from organic search. It is frustrating and demotivating to write content that does not drive any traffic. Sure not every piece will have lots of traffic but you are building a resource that helps a group of people solve related problems. The larger your body of information, the more helpful it is, the bigger percentage of that topics search traffic will come to you. You want to target the largest niche in terms of queries that you can be on page 1 for with your content. You need to create a rich set of content that is interesting and relevant to a particular topic. You need to be a trusted source providing valuable content that answers questions and solves problems. Unless you are building a SaaS product or other app, affiliate marketing content shouldn’t feel formulaic. It’s also important to keep it as fresh as possible for your readers. You need more than one type of content to keep readers engaged. If you simply have a website with a few reviews and a blog, visitors will get bored. Different content types also create the opportunity for different distribution channels. Consider formats like funnels, landing pages, eBooks, webcasts, infographics, videos, white papers, case studies, emails, and newsletters. Think of it as building blocks of traffic. All the small pieces can add up to a large fortress. Content must have topical relevance. Bouncing around from topic to topic is not a productive strategy. Google and other search engines will rank your content based on how relevant it is to the user query. The ranking will take into consideration an article’s specific relevance and the authority of the site within the topic. Choose a niche carefully with keyword research and stick to it. Don’t add products just because they pay well or are “hot” if they are not relevant and useful to the niche audience. Start with a relatively narrow niche and add more related topic silos as you grow. There is a lot of competition for search traffic. The first impression of the site should not be “oh another affiliate site”. A better first impression would be “wow that’s interesting I didn’t know that”. Don’t put sales first, put solving problems for your audience first. Be very selective in the products you offer. Find new, trending products that will click with your audience. You want products that will excite your visitors. It is important to know your audience and their needs. When you choose your niche and create your content and offers, you should have a target audience in mind. Create characters that represent your target demographic. Craft your content to be appealing to that audience. What resonates with a young college grad is not going to work as well with a retired nurse. Consider your audience when you design artwork and select color pallets for your site. Don’t be in a hurry to add affiliate links and products. You need to earn the right to ask for a sale or make a recommendation. If a stranger came to you and said, “this is the best umbrella I have ever used” you would be on your guard thinking … what’s the scam. But if your friend said the same thing, you would break out your wallet. The reader should be the focus of all of your content. Who is this for? How will it help them? Why will they care about this information? Is this the best information available on the topic? Don’t write about or recommend a product that you haven’t researched, aren’t familiar with, haven’t tried, or have no specific experience with. Readers will see through this and you will lose trust. If you want to mention other secondary products in a review, be honest. Tell the reader, “this product has a good reputation but I have not reviewed it.” People appreciate that kind of honesty. It shows you are looking out for them and adds more weight and credibility to the products you do recommend. We are living in a diverse social world. Traffic from non-search is key. You want to cast as wide a net as possible for promotion and repurpose your content where appropriate. Some niches fit better with certain channels but consider at least. YouTube in particular works very well for many affiliate niches. Video product reviews are a great option. SEO means different things to different people. Many are stuck in the past thinking SEO is a way to beat or game Google and other search engines by stuffing keywords into your content. Short of black-hat techniques like PBNs (which do work but have a large risk and expense) SEO has evolved to be creating the best-structured information to help search engines understand your content and its topical relevance. Keywords analysis is used throughout affiliate marketing. Right from the beginning step of finding a niche to evaluating what content to write about. There are lots of great tools for doing this type of research. We cover keywords in detail in our blog section on affiliate SEO. Because you have no access to the actual Google algorithms for search results, with affiliate SEO you are often in the mode of wondering if something is correlation or causation. Like with titles and meta-descriptions, yes I focused on and improved the title and meta descriptions, the rankings improved so the title and meta must be Google signals you can game. In this case, it may be just good marketing. A better title that you A/B test and choose a winner – may generate more clicks. The meta-description may do a better job of bringing in people looking for details. They have better bounce/time on page rates. Give your content the best chance to be found and correctly analyzed. This is what SEO is these days. You need to properly structure your content. You need a fast-loading site. You must be mobile friendly. Affiliate SEO is a large topic but very important. Off-page SEO is the sum of all the traffic sources and links back to your content. The often promoted idea that if you just make great content you will get backlinks is silly. Of course, you need to promote your content to get the most and best quality backlinks. Many affiliates will have high commission products that warrant extra marketing attention. If you have a product that you feel is a great and valuable fit for your audience. Create a landing page or funnel for it. Use these tools to optimize your conversion rate (CRO). Consider Facebook retargeting or other high conversion rate ad campaigns if the commissions are sufficient. Sending a cold lead from an ad campaign to the affiliate offer is almost always a poorer conversion than sending them to a landing page. Check out our article about using landing pages and funnels. Niche sites typically have a certain writing style. The main thing is to have a consistent voice. You want to be like a friend, not a professor giving a lecture. There are no hard rules but you need to consider that many people are skimming your content so you typically want a short, chatty style. Here’s some more information on affiliate writing mechanics. You also need to have great visuals. Nothing gets more people to bounce than walls of text. We have created a resource for finding free graphics. Affiliate marketing isn’t difficult if you have an audience and trust — that’s the hard part. Content Marketing is a great way to build your audience. Create content that helps people and you will build trust. It does take time but it is evergreen and the foundation for your site’s success.